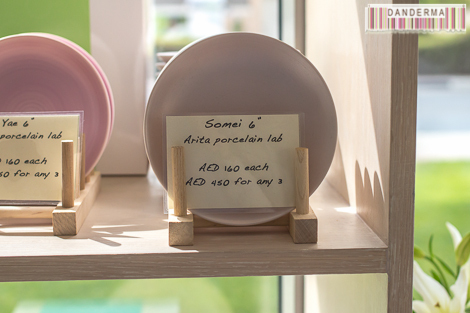 On the night before I left for my eid holiday in Dubai my friend Mira whatsapped me about Yamanoti, a newly opened Japanese bakery & cafe in Dubai thinking I’d like to check it out. She was right of course, for the moment I set my eyes on their instagram account I knew I wanted to try it on the first day of Eid and I did manage to do so. Yamanote in Dubai is located in Al Wasl Square, a totally new place to me. I’ve never been there before and it was interesting to walk amongst the different shops and restaurants, but it was also quite hot indeed. It is August after all. Yamanote itself is Dubai’s first Japanese cafe and I thought it was a franchise until I read on their instagram account that they are A UAE established boutique Japanese bakery! How cool is that? Yamanote was indeed worth the visit and if you are going to Dubai anytime soon it should be first on your list of breakfast places. 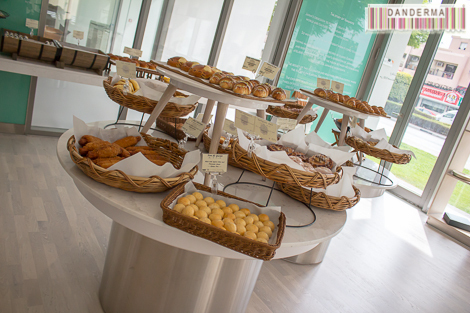 Spacious and inviting, with lots and lots of baked goods on display and a bright interior with white and blue walls, wicker chairs and marble topped tables, and floor to ceiling windows letting the afternoon light stream in. 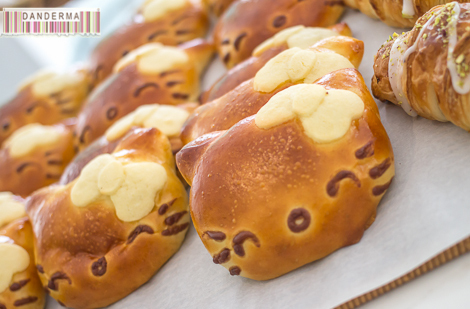 The hello kitty baked buns are the first thing to capture my attention. After crooning over them for a few seconds, you begin to look around and notice your surroundings. 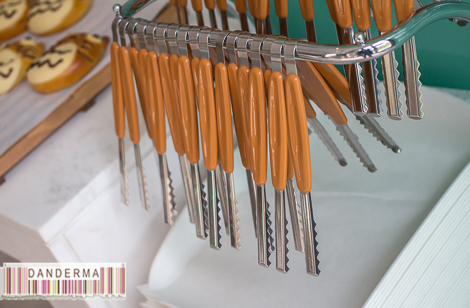 There is a stack of white trays with a group of tongs hanging over it which spells out self service. Reminded me of the Alamiya bakery days back in the 80’s when people actually bothered to serve themselves. I wasted no time grabbing myself a tray and a pair of tongs and proceeded to make my choices. A little card with the name in English and Japanese was over each baked item. I took my sweet time, going back and forth and trying to decide what I wanted and took plenty of pictures. No one bothered me at all or stood over my head talking and distracting me in the name of trying to help me, I was really grateful for that. 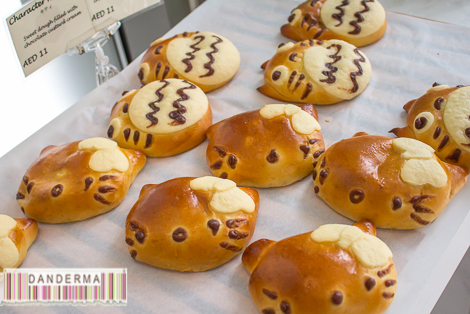 There were two kinds of Hello Kitty baked goodies: one filled with custard creme and one filled with Nutella! 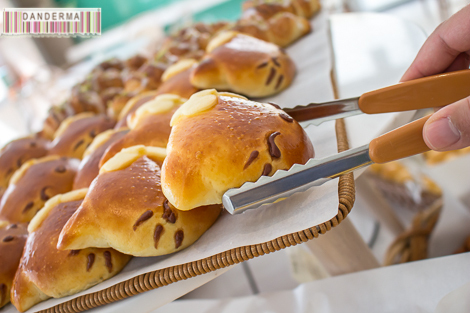 There were also owl shaped baked goodies, croissants, and other things that I’ve seen in Japanese anime but never knew the name -or contents- of. I liked that, familiar yet new and strange at the same time. Plenty of choices, I had the urge to try everything on display! 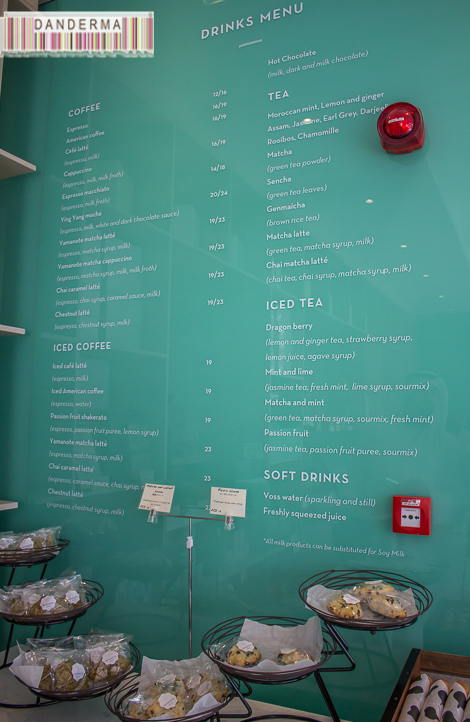 After choosing what we wanted to eat, we headed to the cash register where a long menu of drinks was posted on the wall. Their service is incredible indeed, they didn’t bother us at all when taking pictures and choosing our food, but the moment we asked for their help choosing something from the drinks menu they were all smiles and very helpful. I wanted to try this white pudding, the little jars looked so cute and straight out of a Japanese anime but we’ve ordered more than enough. Next time for sure by god’s will. 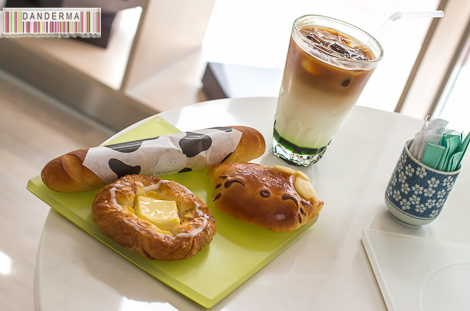 Yamanote also sells different items like different flavours of tea and lots of dinnerware and accessories. 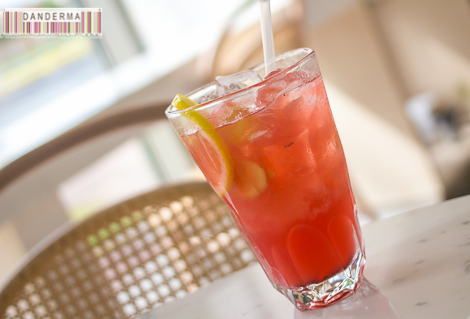 After placing our order for drinks and paying we took a seat overlooking Al Wasl Road, watching cars passing by. What did we have? 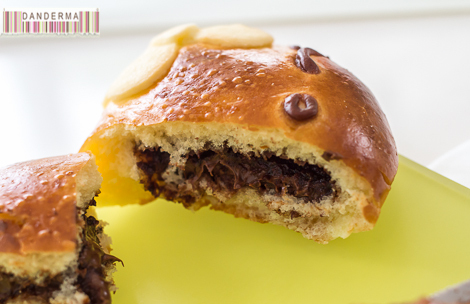 I chose the Nutella filled hello kitty bun, a small baguette-like bread called milky bun filled with what tasted like clotted cream -qaymar-, and the kiri custard croissant. 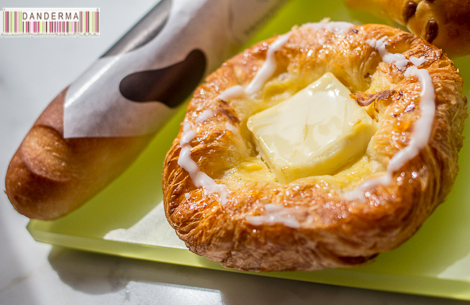 I was told the Kiri Croissant was their best seller and my eyes popped when I first saw it’s picture on instagram. Mamma mia, does that look good or what? 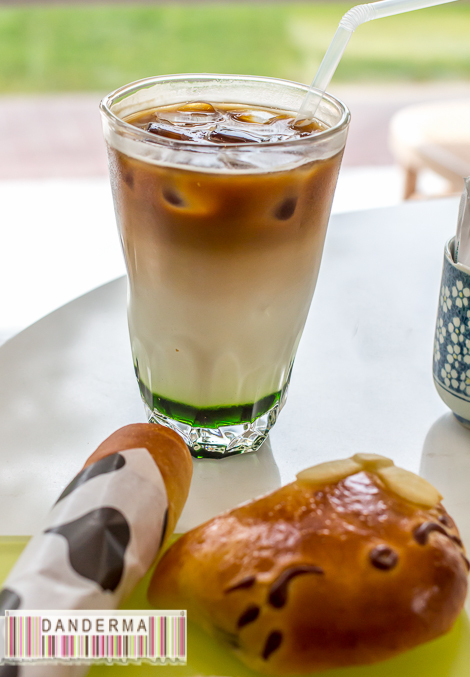 To drink I had the Yamanote iced matcha latte and we also ordered the Dragon Berry iced tea. My matcha iced latte was cool and refreshing. 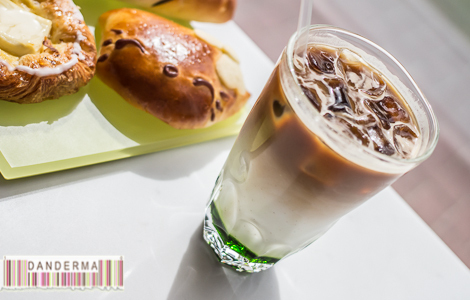 Made with ice, espresso, milk, and a green Japanese matcha syrup which I’ve tried for the first time in my life. It was good, with the matcha syrup adding a different weird flavour kick. It was good weird, not bad weird, like sweet green tea. I need to do some research regarding this kriptonyte-green syrup! 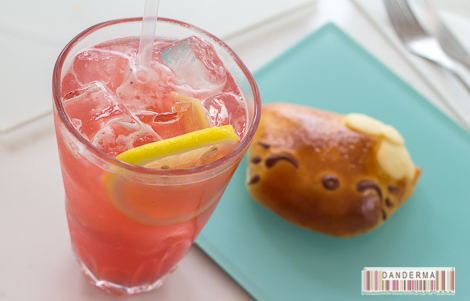 The dragon berry iced tea was delicious! Lemon & Ginger Tea, with lemon juice, strawberry syrup, and agave syrup. It was so good I actually stole it from my poor unsuspecting companion and nearly drained it in one long sip. 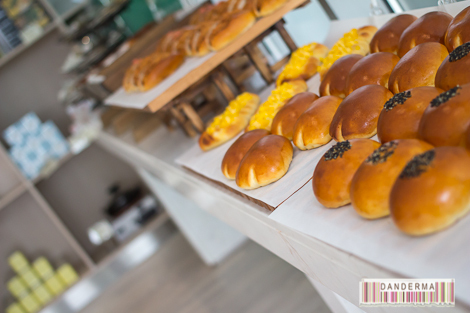 The pastries and bread we chose were freshly baked and quite good. 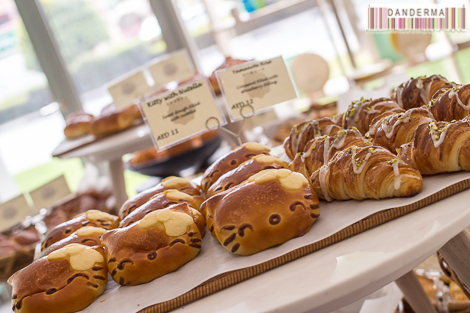 I liked the Kiri custard croissant the most and loved the fact that it wasn’t overly sweet but thought the hello kitty Nutella bun was too thick for my liking. The service proved their excellence once more by letting us enjoy our meal in peace. No one loomed over us, or peered into our food, or just waltzed all around your table to annoy you, something I’m very thankful for. 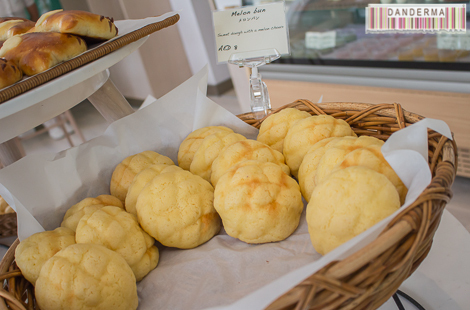 It was a very peaceful quite afternoon in a lovely Japanese bakery with adorable and really fresh tasty food. 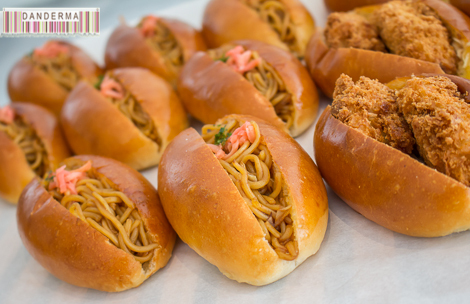 There are plenty of delicious things to go back for and many new flavours to try like the white pudding, the matcha sweet, the matcha scone, the rose croissants, and perhaps one day the bun filled with noodles and topped with ginger. 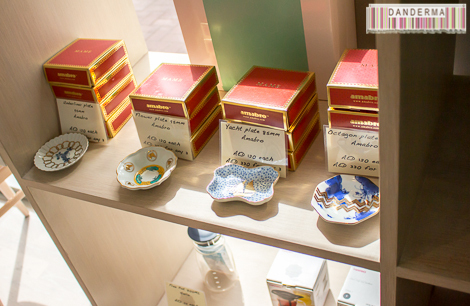 They also have gift boxes where you can bring home a box of pastries with tea powder and tea cups, a gift that would make any Japan-fan extremely happy. 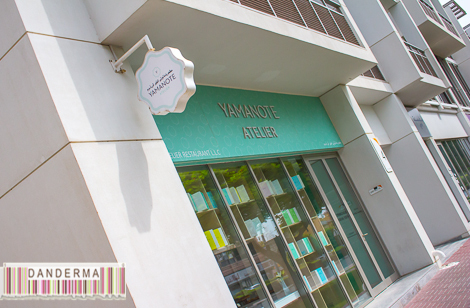 I cannot wait to go back again and as they say in Japanese, Yamanote Atelier is kawai for sure. 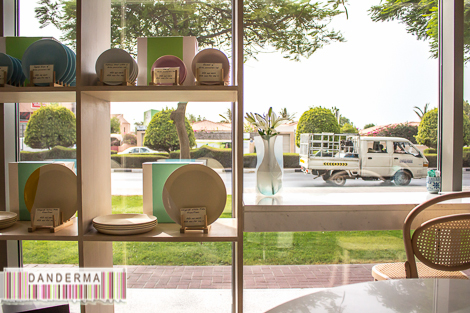 Yamanote Atelier is located in Al Wasl Square complex overlooking Al Wasl road and right beside Safa Park. 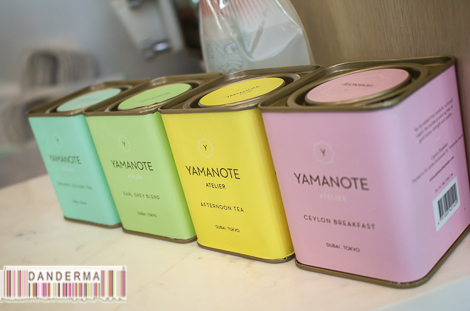 For more information you can check their website (link), give them a call on +(971)-43881811, or follow them on Twitter (@YAtelier) or on instagram (@YamanoteAtelier).